Yes, I thought, what makes Bernhard uniquely disturbing appears to have something to do with his personal reticence, a silence reminiscent of the terrible solitude out of which his characters begin to speak and yet which seems to have been Bernhard's only way of speaking, a kind of self-stifling game, or something to do with how his work emphasises the solitude necessary to all writing, its remove from Sunday Supplement profiles, bookshop signings and prize ceremonies (hence their spectacular proliferation) and why it is best to go, like Bernhard, in the opposite direction, even if that means reinforcing exceptional solitude. 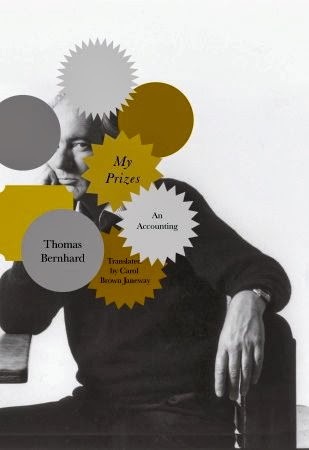 But what might be worth saying again is the significance of the recurring ambiguity of the reckless acts in Bernhard's fiction, something repeated throughout My Prizes. In the first essay he needs a suit for a ceremony and at very short notice chooses one from the rack of a posh menswear store. After the event he decides it's too small, takes it back to demand a replacement, which, to his surprise, he receives. For the next prize he decides the money should go towards buying a house, so an estate agent lines up twelve farmhouses in upper Austria for a full day's viewing. The first is mouse-infested, has damp-rotted floors and is much too big, but, before he's seen the second let alone the twelfth, he decides to buy it there and then. Days follow in which he frets over the decision: the prize money will pay only an installment – so where will he find the money to pay the remainder let alone refurbish the building? We don't find out but we know from elsewhere the farmhouse became his country retreat for the rest of his life. Later, another prize pays for "storm windows". Another prize prompts him to buy a car despite having never driven one. In a showroom he sees a Triumph Herald and once again buys it on the spot, demanding the example on show to drive away immediately. He drives to Croatia where he and his "aunt" had rented a villa. In his room he writes the terrifying novella Amras, sends it to his publisher and, to clear his head, goes for a drive along the coast and promptly has a life-threatening accident. Back in Vienna, he hires the best and most expensive solicitor to deal with the case and frets about the extravagance given the regular ill-fortune of cross-border justice. But once again things work out and he gets more money in compensation than he had ever hoped for. These are just a few examples of reckless behaviour from the nine essays but, as I said, they appear throughout his work. I've mentioned before the famous bike ride in Gathering Evidence and the abrupt changes in habit that recur in various novels, such as the beginning of Gehen, translated as Walking, apparently his breakthrough work stylistically. Except in My Prizes he doesn't talk about his work! The car and the crash are discussed in detail but Amras itself, this extraordinary work whose 50th anniversary it is this year, is mentioned only in passing and almost dismissively as "romantic, something born of a young man who'd been reading Novalis for months". The most notable example of behavioral change comes at the beginning of the valedictory novel Extinction, with perhaps the greatest opening sentence in modern literature. On the twenty-ninth, having returned from Wolfsegg, I met my pupil Gambetti on the Pincio to discuss arrangements for the lessons he was to receive in May, writes Franz-Josef Murau, and impressed once again by his high intelligence, I was so refreshed and exhilarated, so glad to be living in Rome and not in Austria, that instead of walking home along the Via Condotti, as I usually do, I crossed the Flaminia and the Piazza del Popolo and walked the whole length of the Corso before returning to my apartment in the Piazza Minerva, where at about two o’clock I received the telegram informing me that my parents and my brother, Johannes, had died. Parents and Johannes killed in accident. Caecilia, Amalia, it read. The implicit connection of the change in Franz-Josef's routine to the change in his fortune comes from the excess of detail within the proliferating clauses and the desolate two-sentence telegram that follows immediately. But how can they be connected? The connection is both obvious and absurd. However, rather than seek cause and effect, we need only see this perplexity as the birth of the narratives we are reading and the voices of individuals rising from the predicament of "exigency, necessity, inexorability", as Bachmann describes it. This is the key to Bernhard's radicalism and why he is more than a scourge of bourgeois pretensions, or whatever else the critics say, and why it's impossible to pin him down. His prose soars, exploding like fireworks illuminating the landscape for a moment before plummeting to earth in darkness. If he knew where he belonged, what he wanted, what he had to say and to what end, in what conversation or non-conversation he might participate, his work would be very different; das gewöhnliche Zeug, to borrow Kafka's uncle's phrase: the usual stuff. The thing I find most terrifying is writing prose…it’s pretty much the most difficult thing for me…And the moment I realized this and became conscious of it, I swore to myself that from then on I would do nothing but write prose. Of course I could have done something completely different. I have studied many other disciplines, but none of them are terrifying. A beautiful, Bernhardesque opening paragraph. First, Stephen, I must resonantly echo vm’s comment. Second, thanks for drawing attention to the importance of enacted recklessness in Bernhard’s work. As a lexical unit, “recklessness” (Rücksichtslosigkeit, sometimes also translated as “ruthlessness” or “irresponsibility”) is of course one of Bernhard’s most beloved motifs, but I had never reflected before on how often he and his characters do not merely talk about recklessness but also behave recklessly –nor of how closely this recklessness is implicated in the even more prominent Bernhardian motif of terror. 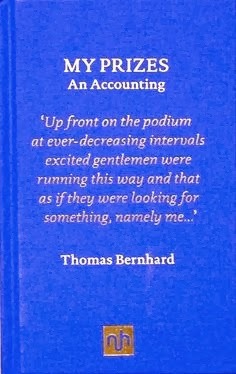 Finally, I am always rather perplexed by complaints that a given Bernhard text is inferior to another one, because in my view, Bernhard is one of those writers whose work—as Proust said of Balzac--always rises to the same level of intelligence. And I do not say this as an uncritical expression of my admiration of this corpus, but as a description of Bernhard’s method of composition, which virtually insures that whatever he writes will be coherent and compelling by the same standard. Most centrally, in my view, this method consists in the parsimonious disposition of motifs. 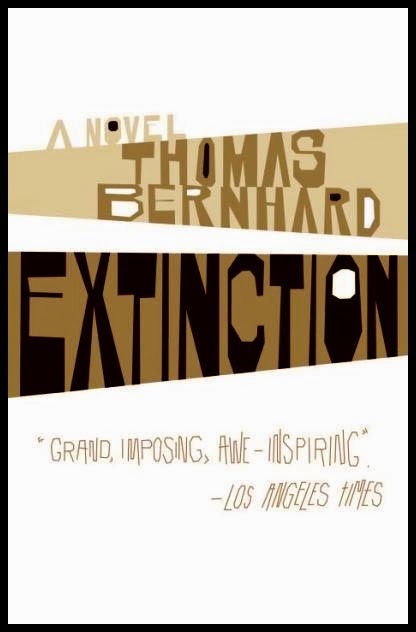 The sentence from Extinction you quoted is a perfect example: almost everything he will expatiate on in the first half of the book—the telegram, his parents, his siblings, Gambetti, and Rome vs. Wolfsegg—is included in it. But the opening sentence of the Bremen acceptance speech is an equally perfect example, with its obsessive iteration of the word “fairy tale,” which prepares for the succeeding disquisition on the chilling of existence in the post-fairy tale world governed by science. The novel is a greater work than the speech because it involves a larger number of motifs deployed on a grander scale, but the speech is no less an accomplished specimen of his mastery. Those who don’t like the method, who see it as mannered or contrived (because they don’t see that it’s not simply word-juggling, that you can’t do this kind of thing with just any old word or concept [as the examples of recklessness you cited prove admirably]), obviously will not like the novel or the speech, but it’s odd to think of someone loving the one and not the other. Thanks so much for this Douglas, and thanks to VM too. The sense of a coherent and compelling standard is clearly what prompted me to write this but never quite came to the fore in my mind as I wrote. Also, I meant to end by saying that to write as he did was itself reckless and that writers wishing to learn from him should above all learn the value of recklessness. Share book reviews and ratings with Stephen, and even join a book club on Goodreads. Please email me at steve dot mitchelmore at gmail dot com. Contact steve dot mitchelmore at gmail.com. Powered by Blogger.